An easy delicious treat that's perfect with a cup of coffee. This little treat has a cream cheese and nut filling with a slight coffee flavor in the center of a crescent roll. 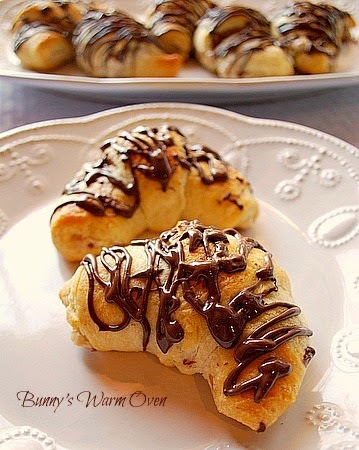 It's then drizzled with melted chocolate,what a nice little bundle of joy this is. The best part is these Chocolate Cream Cheese Crescents are made with crescent rolls from the refrigerated section of your grocery store. They are very easy to make, the baking time after assembled is about 15 minutes. Need a quick delicious dessert in a hurry, this little number is it! The recipe calls for macadamia nuts but you could use any nut you have on hand, I had almonds which I finely processed in my food processor. 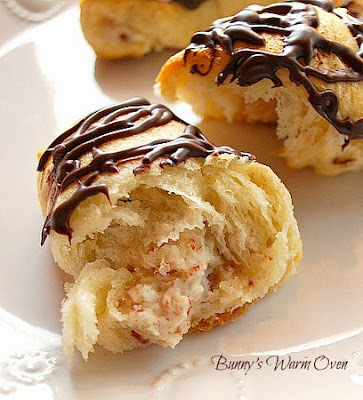 What I love about baking with crescent rolls is they are so flaky and buttery all by themselves, the filling and chocolate just make them all that much better! Enjoy! 1 Heat oven to 350°F. Lightly grease cookie sheet. In small bowl, combine powdered sugar, cream cheese, liqueur and vanilla; blend well. Stir in macadamia nuts. 2 Separate dough into 8 triangles. Spoon 1 heaping tablespoon cream cheese mixture onto shortest side of each triangle. Loosely roll up, starting at shortest side and rolling to opposite point. Place, point side down, on greased cookie sheet; curve into crescent shape. 3 Bake 12 to 15 minutes or until golden brown. Cool 5 minutes. 4 Meanwhile, in small saucepan over low heat, melt glaze ingredients; stir until smooth. Drizzle over warm rolls. Serve warm or cool. Store in refrigerator. Let's hear it for Pillsbury crescent rolls! Sometimes a girl just doesn't need to bake from scratch. These look just wonderful, Bunny. Oh my gosh Jane so good to hear from you! I stopped by your blog a few weeks ago and saw you were taking a break. I miss you!! These look amazing! I love cream cheese in pastries. They were very good Kaitlin and so very easy to make! Thanks for stopping by!